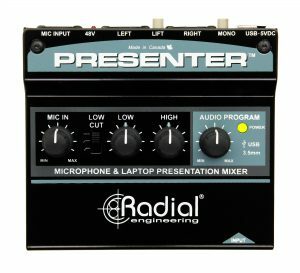 Will the Presenter work with condenser (powered) microphone? 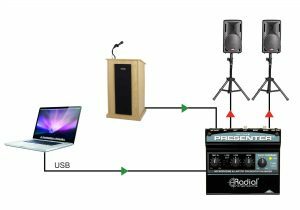 Yes, simply engage the recessed switch next to the Mic Input to activate 48V phantom power for a condenser microphone such as a podium mic. Will the Presenter work with a wireless or lavalier clip-on microphone? 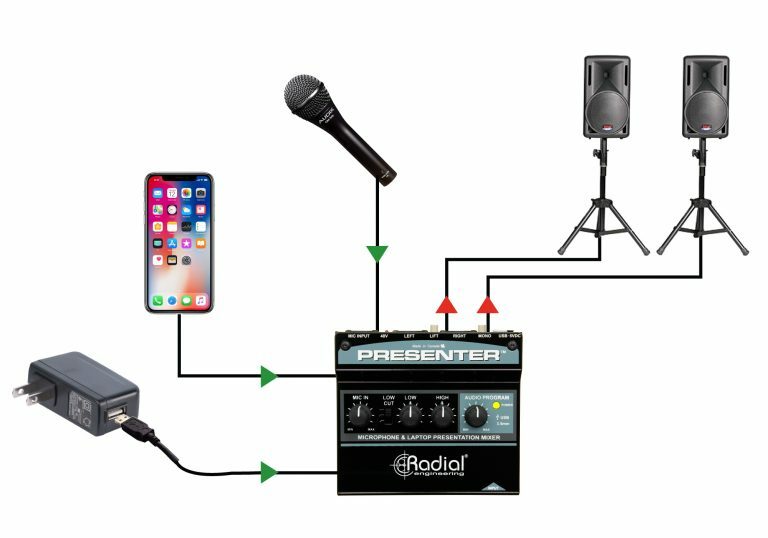 Absolutely, just connect the balanced output from your wireless receiver to the Mic Input on the Presenter. If you have a mic/line switch on your receiver, ensure that it is set to mic. Does the Presenter need to be plugged into a laptop for power? 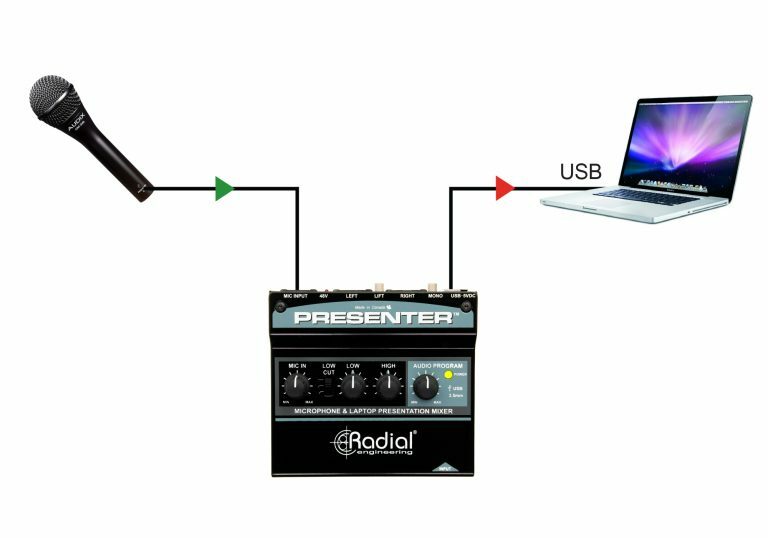 The Presenter can be powered by a laptop computer, but it can also be powered on its own. A separate USB power adapter is included to allow you to plug the Presenter into an AC outlet for power. Why is there a Low-Cut switch and a Low frequency control? 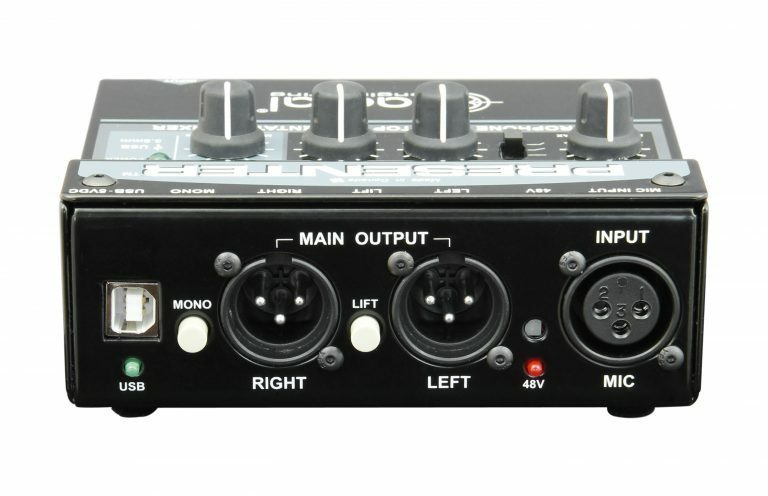 The Low-cut switch allows you to engage a filter that helps to remove excessive low end that results from the proximity effects or rumble from a microphone mounted on a podium. The variable Low EQ control allows you to boost or cut a range of low frequencies to tailor the voice of the speaker to better suit the playback system and the acoustics of the room. Does the Presenter require drivers in order to connect to a laptop computer? No, the Presenter is a plug and play device, and does not require any drivers in order to work. It will show up as an available input and output device as “Radial USB 1”. 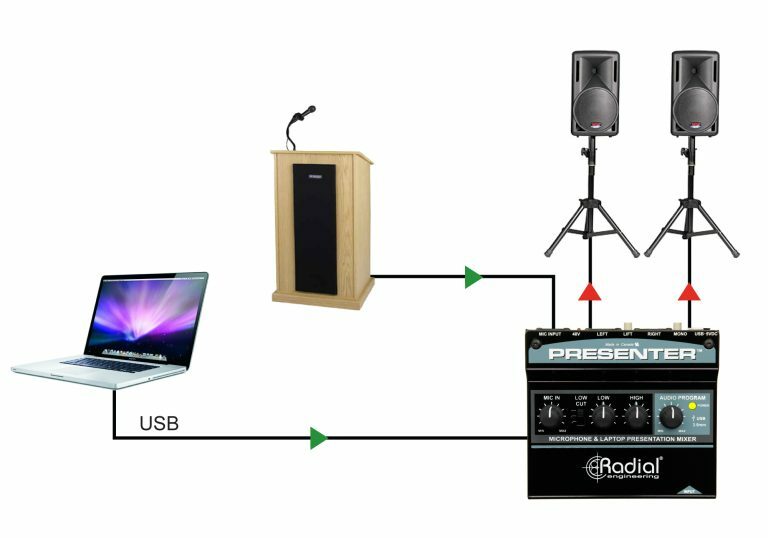 The Presenter is connected to my computer, but audio is still only playing back through my laptop speakers. 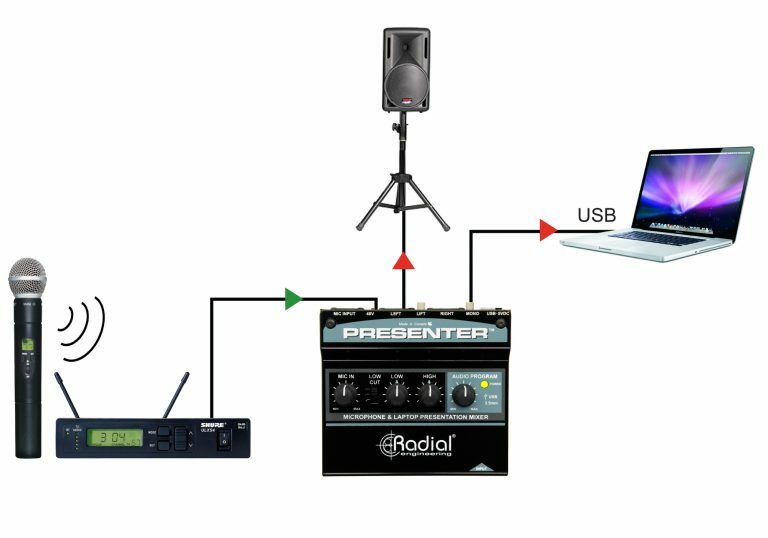 How do I send audio from my laptop to the Presenter? Ensure that you’ve selected the Presenter as your default audio playback device. On computers running Windows, this is done in Control Panel > Sound > Playback: right-click on “Radial USB 1” and choose “Set as Default Device”. On a Mac, navigate to System Preferences > Sound and select “Radial USB 1” as your default output device, or simply option-click on the speaker icon in the menu toolbar and select “Radial USB 1”. Can I use the USB audio input and the 3.5mm input at the same time? No. The Presenter automatically senses when a connector is plugged into the 3.5mm jack and disconnects the feed from the USB input. Can I connect a set of headphones to the front 3.5mm connection? No, this is an input only, designed to connect to your smartphone or mobile playback device. Can I connect my iOS or Android device to the Presenter using a USB cable? The Presenter’s USB input is only designed to be used with laptop computers. To connect any mobile device to the Presenter such as a smartphone or tablet, use the 3.5mm input provided on the front of the unit. 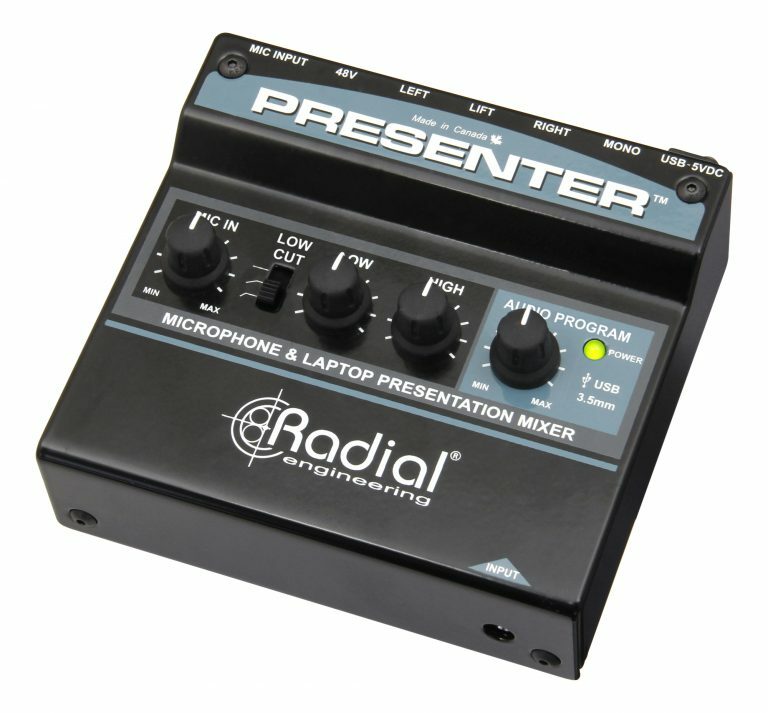 Will the Low and High EQ controls affect the USB or 3.5mm inputs on the Presenter? No, these controls are only to adjust the tone of the Mic Input. Any signal you feed to the USB or 3.5mm input will pass cleanly to the Main Outputs. I hear a humming noise in the speakers when the Presenter is connected, how can I fix this? When two or more powered audio devices are connected, there is the possibility of encountering hum or buzz in the system — this is known as a ground loop. The Presenter has a Lift switch that is designed to help eliminate buzz and hum from ground loops, simply press in this switch to break the ground loop and remove the noise. I have a microphone with a 3.5mm output, can I connect this to the 3.5mm input on the Presenter? 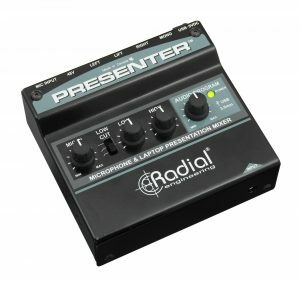 No, the 3.5mm input on the Presenter is a stereo input designed to connect to a smartphone, tablet, or other mobile device. 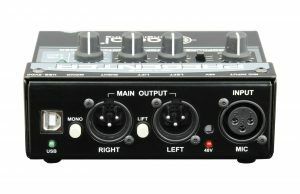 The output of a microphone will be too low to connect to this input. Is there a power switch for the Presenter? No, as soon as the Presenter is provided power via the USB connection it the POWER LED will illuminate and the Presenter will be ready to use.